Through the Moderator Controls window, you have the ability to change how the overall "sustainability score" is calculated. By default a player's "sustainability score" is a simple, unweighted average of their economy, energy and environment sub-scores. In the pop-up, this is indicated by each component getting a "1" weighting and each comprising 33.3% (1/3) of the sustainability score. What is considered to be sustainable varies depending on values and perspectives of different individuals and groups. Therefore it can be useful to adjust how much weight (importance) is given to economy, energy and environment in the game. By adjusting how sustainability is scored in the game, players can better understand how sustainability is a complex and somewhat subjective concept. Players can also see how changing score weightings affects their strategy and can cause unintended consequences for their farms and the game world. A simple way to collectively define the sustainability score with a group of players would be to have everyone vote for which component of sustainability they think is most important - environment, energy or economy. The moderator could then enter the vote totals next to each category. Another variation would be to ask everyone to rate the importance of each on a scale of 1-5 and then enter the group totals or averages for each category. You can enter any number (integer) into the boxes next to each score component. The ratios are automatically converted to percentages on the right to help interpret how much importance each component score will be given. As an example, if you wanted the sustainability score to be an average of energy and economy, then you could enter a "1" for economy and energy and a "0" for environment. 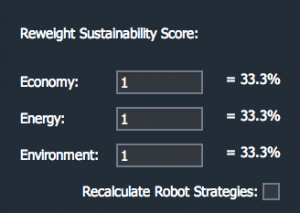 Check the "Recalculate Robot Strategies" box if you want the computer generated players to adjust their strategies to the new sustainability score. If you do not check, the computer players will continue to try to maximize the sustainability score based upon the previous weightings. Note: you can also manually adjust each bot's goals. Click "Apply Changes" at the top of the window to make the update.